It doesn't seem to matter what uniform or league Matt Manning is playing in, the results have been strikingly similar. Detroit's No. 3 prospect shined in his Double-A debut, allowing three hits and striking out eight over six scoreless innings but Harrisburg rallied for a 5-4 win over Erie on Wednesday night at FNB Field. Second-ranked Nationals prospect Carter Kieboom ripped a two-out, two-run double to walk it off for the Senators. Manning earned a promotion from the Class A Advanced Florida State League on Friday after going 4-4 with a 2.98 ERA and a 0.99 WHIP in nine starts with Lakeland. The move came nearly two months to the day of his previous assignment from the Class A Midwest League, but the 20-year-old treated it like any other start. "It was normal for me. I just wanted to go out there and pitch my game," Manning said. "I was able to keep their guys guessing a bit, especially with my changeup. I got a lot of swings-and-misses and soft contact using it. It was a big pitch for me tonight and helped keep the hitters from zeroing in on me." Manning retired Alec Keller on a groundout to second base to begin his SeaWolves tenure. He worked in and out of trouble after plunking Kieboom and surrendering a single to Washington's No. 8 prospect Daniel Johnson, but he struck out 12th-ranked Raudy Read and got Jake Noll on a comebacker. No. 30 Drew Ward singled off Manning in the second inning, but MLB.com's No. 56 overall prospect struck out a pair to keep the game scoreless. Keller's leadoff single in the third marked the last hit Harrisburg got off Manning, who retired the side in order in the fourth before doing some heavy lifting in the fifth. Ward drew the right-hander's only walk and took second on a wild-pitch strikeout. A balk pushed the runner to third, but Manning whiffed Osvaldo Abreu and got some nifty defense from Tigers No. 11 prospect Willi Castro to escape unscathed. "[Double-A] is definitely a tougher environment to pitch in," he said. "But that play [by Castro] really gave me a second wind. It was a great effort and that's one of the perks of playing with such talented players the higher you go in the Minors. You get out there and throw and let your defense do the work." Manning began the sixth with back-to-back strikeouts of Kieboom and Johnson and retired Read on a flyout to left on his 91st and final pitch. He became the first Erie pitcher to fire six scoreless innings in his debut since Michael Fulmer tossed 6 2/3 shutout frames against Portland on Aug. 4, 2015. "It was nice to walk off the mound after a start like that," he said. "[Erie pitching coach] Willie Blair told me I did a great job and that he was impressed. All the guys were happy and supportive and had nothing but good things to say. Now that it's out of the way, I want to finish strong and get through my last outing on a high note." The ninth overall pick in the 2016 Draft has emerged as one of baseball's best young hurlers during his first full-season campaign. The native of Elk Grove, California, went 4-2 with a 3.18 ERA in 14 starts between Class A Short Season Connecticut and Class A West Michigan in 2017. He began the year with the Whitecaps and posted a 3.40 ERA with 76 strikeouts in 55 2/3 innings before he joined the Flying Tigers on June 24. "It was good for me to come up and not start right away," Manning said of his Aug. 24 promotion. "I was able to show up and not feel any extra pressure to get out there and show off. I was able to get a good vibe going with my teammates and I think waiting a few days helped me relax and put up some good results." Through 21 starts this season, Manning is 12-11 with a 3.03 ERA and a strikeout-to-walk ratio of 147-to-48 in 113 innings. 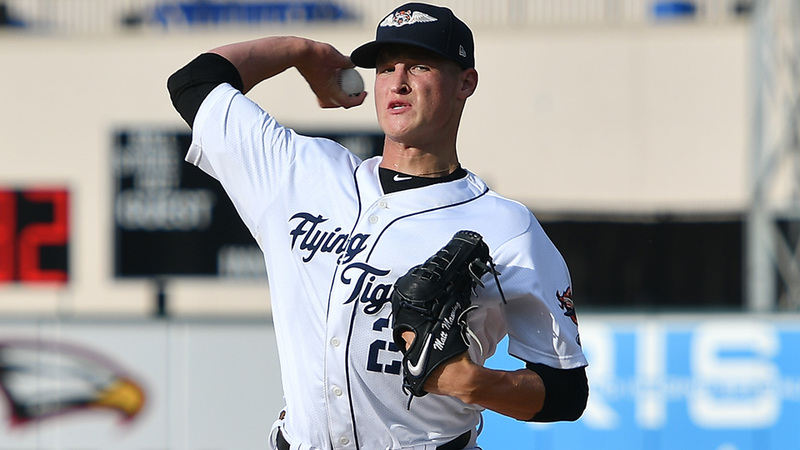 Tigers 30th-ranked prospect Nolan Blackwood and John Schreiber (3-7) combined to allow five runs on seven hits over the final 2 2/3 innings. Jake Rogers -- Detroit's No. 11 prospect -- doubled and singled for his fifth multi-hit effort in 11 games. Castro chipped in a double and a single. Harrisburg starter Logan Darnell was charged with three runs on eight hits and two walks with four strikeouts in five innings. Bryan Harper (2-1) picked up the win after striking out two over 1 1/3 scoreless frames. Ward homered, singled and walked for the Senators.